The passing of Kaimi Nakapaahu, 1920. KAIMI NAKAPAAHU, MY DEAR BROTHER, HAS GONE. Mr. Solomon Hanohano, Editor of the Kuokoa, Aloha oe:—May your patient heart welcome these tears of love for my dearly beloved brother who has left his wife and their beloved lei, a daughter, as well as his brothers and sisters in great sadness for him. The supportive bond within has been severed, we are heavyhearted to inform the many friends and companions of my beloved brother who passed, from the Kumukahi where the sun rises to the setting of the sun at the pleasant base of Lehua. Aloha, much aloha for my brother who has gone afar; no more shall we see your face, you are gone forever. My shock was immense at hearing the sad news, told to me, his sister, that my beloved brother had passed. We did not witness his last breath; he carried alone his illness, and it is his death that revealed this to us, and we were beset with sadness and regret, we who were of the same womb [pupuu hookahi], as well as his companion, his wife, and the neck lei of my brother’s that he was to wear until grown [his daughter], we grieve for him in this world of much suffering. He was born of the loins of Mr. and Mrs. Luka Nakapaahu, our parents, on June 22, 1884, at Waimea, Kauai; and died at Hilo Hospital on the 28th of February. He was employed by the inter-island ferry as a sailor, with the thought that then he’d be able to see the famous land of Hilo, but here the life breathe of my beloved brother was taken away and he was returning as a corpse to his birth land of our ancestors and parents who went before him to the other side. Aloha, aloha for the body of my beloved brother who has gone afar, travelling alone on your billows, O Alenuihaha, and arriving at the land of the Kukalahale rains [Oahu], being kept at Mr. Williams’ place; and then once again carried by the Kinau by which I brought the body of my beloved brother atop the shifting billows of Kaieie; no more will you moisten his young face with your sea spray for all times. My brother and I arrived at Nawiliwili on the 12th of March, and we remained patiently aboard the Kinau until the most of the passengers disembarked, leaving just me and my brother, and when the freight was done with for that place where our kupuna lived, [?? pau na mili ana ia holo aku o kauanoe o Koloa, kahi i wahi,] for it was perhaps not known that I had an important delivery, and with tears, the ship went on to and stopped at Makaweli, and when the freight there was taken care of, i thought of seeing my elder siblings and our younger siblings waiting for me bringing back our beloved brother; the Kinau entered Waimea at 5 in the evening, and made way for the sands of Luhi; how sad, Kaimi Nakapaahu will no longer tread on your soft sands, O Waiula and Waikea; he will no more swim in those wondrous waters of the land. We were let off; waiting patiently for us were his wife and child, along with our older siblings and our younger ones. We reached the house, he was laid out, and we saw his face and were struck with much aloha and regret; on the following 13th, his funeral was carried out by Mr. H. M. Nawai, and we took his body and put it to rest by the side of our beloved father; and the words of the Great Book came to pass: man’s life is vapor that appears and vanishes. We give our thanks to the inter-island ferry [moku holo piliaina] for agreeing to return the body of my beloved brother who has gone afar, to his land of birth to lie with our father. Aloha, aloha my brother who has travelled alone on your two seas, O Hawaii. We give thanks to everyone who came and stayed up with our beloved one the whole night, as well as those at the grave of our beloved who acted with loving hearts. I will conclude here; it is God who bring solace to our never ending aloha, as well as for his wife who is left without, and their child who is without a father. 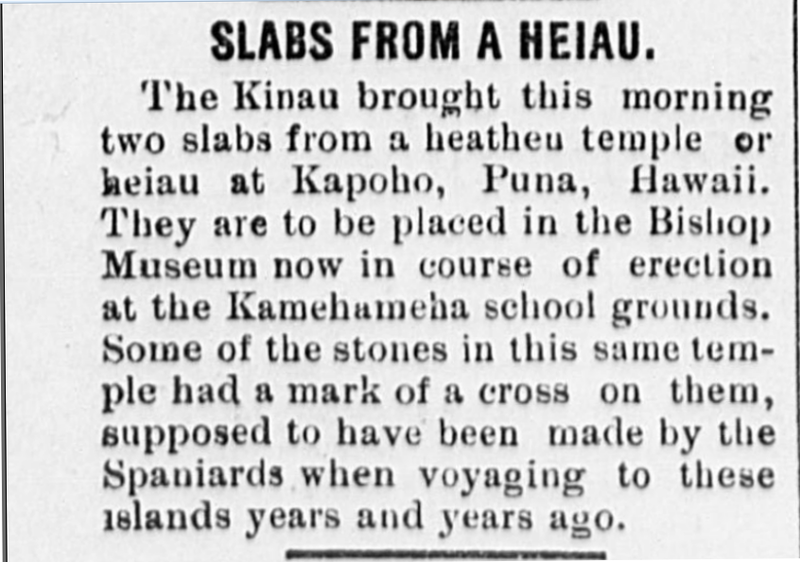 [Another example of how Hawaiian-Language Newspapers provide information not found anywhere else—From what i can tell, the only information about Kaimi Nakapaahu is based off of “The Cole-Jensen Collection : Oral genealogies and genealogical information collected from the Polynesian peoples and from the Pacific Islands.” in Utah. Here however in the announcement by his sister, we have a personal account, with much more added information, not to mention a picture! Ka Nupepa Kuokoa, Buke LVIII, Helu 13, Aoao 3. Aperila 2, 1920.